Aberdeen leapfrogged Hibernian and are now within five points of the Scottish Premiership summit thanks to a thunderous Gary Mackay-Steven goal. The winger celebrated his Scotland call-up by pouncing on a slack pass by Ryan Porteous just before the break. 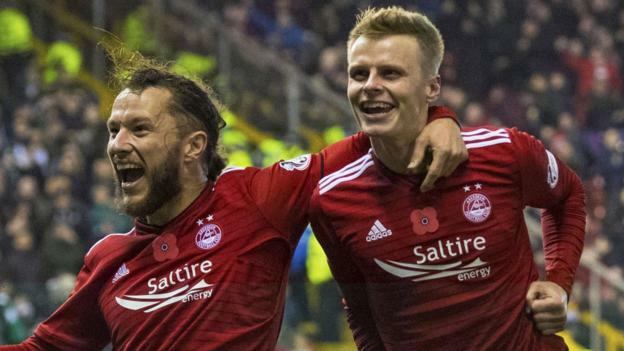 It gave the Pittodrie side a fourth straight win – and fifth in a row at home. Hibs are now without one in four. Neil Lennon’s side improved after the break, but Mark Milligan and Florian Kamberi missed chances to equalise. Given that the previous three meetings had finished level after 90 minutes, two without a goal being scored, it was almost guaranteed to be a tight affair. But both managers were determined to belie the prediction and named attacking line-ups – forward Stevie May being preferred to defensive midfielder Dominic Ball for Aberdeen and Hibs’ Florian Kamberi returning from suspension to partner Jamie Maclaren up front for the first time in the league this season. Despite Aberdeen having four players named in Alex McLeish’s Scotland squad this week and Hibs having three called up by Australia, showing their international class was proving difficult in the strong wind swirling around Pittodrie. Australian midfielder Milligan had an early header cleared from in front of the Aberdeen goal by Shay Logan, but it was one of the home side’s Scotland quartet who was making the difference at the other end. Porteous was looking uncomfortable on the left of Hibs’ back three and, after he picked up a yellow card for a foul on Mackay-Steven, Aberdeen continually provided the winger with opportunities to further tease the 19-year-old. When Mackay-Steven intercepted Porteous’ clearance, the Scotland Under-21 centre-back was easily deceived by a little drop of the shoulder and the ball was soon whistling between the near post and goalkeeper Adam Bogdan’s outstretched hand. It was no surprise when Hibs head coach Lennon changed to a back four at half-time and it helped the visitors. Milligan sent a header over from a good position and Kamberi failed to finish after rounding Joe Lewis. At the other end, May failed to make Bogdan pay for his equally unwise rush from his goalline. Aberdeen had not lost from a winning position at Pittodrie since 2014 and that record was prolonged after Kamberi twice failed to find the target from close range. The wind was the winner, the dreadful conditions stifling what should have been a high-quality affair, but Aberdeen won’t give a jot about that, as their bandwagon continues to gather pace. That is now four wins on the spin for the Pittodrie side, the international break perhaps coming at the wrong time for them. As for Hibernian, they are now four without a victory, leaving plenty for Lennon to ponder over the next fortnight. They created, and spurned, enough chances to win the game in the second half, but that will be scant consolation.